One of the few photographs of the initial bomb damage as seen from USS Princeton’s own flight deck. Photo by Ernest John Schirmer (1919–1962), photographer's mate aboard the ship, courtesy of NavSource Naval History Online Photo Archive. Thirty-one months would pass before MacArthur was able to fulfill his promise. On October 17, 1944, a force of over two hundred American warships appeared off the Philippines; in response, the Japanese readied sixty-four ships—virtually its entire fleet. The U.S. began its invasion on October 20 with a landing on Leyte, an island in the center of the Philippine archipelago. Over the next week forces prepared for and waged the complex series of air, submarine, and surface engagements known collectively as the Battle of Leyte Gulf (or the Second Battle of the Philippine Sea). Japanese losses were heavy—at least 12,000 dead and twenty-five vessels—while the American forces lost six ships and suffered nearly 3,000 casualties. During this battle, on October 25, the Japanese employed for the first time mass suicide attacks (“kamikaze”) by aircraft, a lethal but ultimately futile tactic that continued in the months ahead. “The Battle of Leyte Gulf drove a stake into the empire, splitting off Tokyo’s Southeast Asian holdings from Japan proper,” concludes the writer of a recent magazine article. 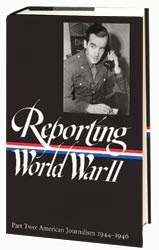 “And it furnished U.S. commanders a launching pad for sea and air assaults against the Ryukyu Islands and the Japanese home islands.” Not only was the multi-day engagement one of the last major naval battles of the war, but it is universally regarded as the largest naval battle in history. 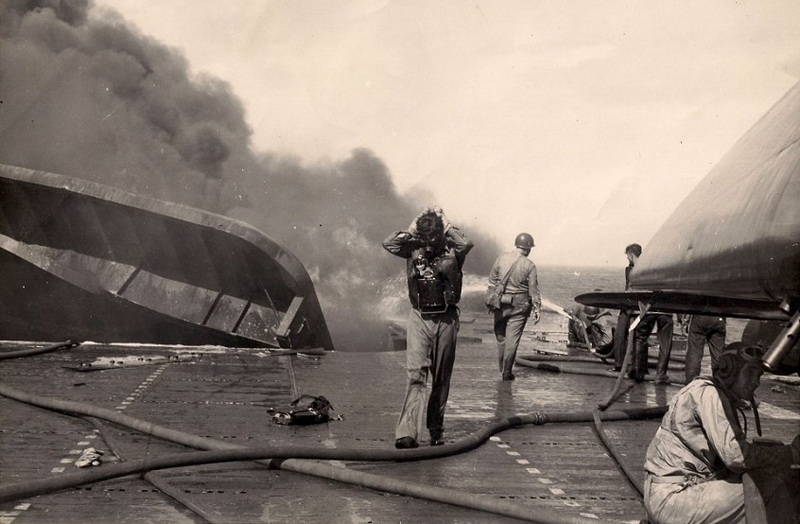 One of the American ships sunk during the battle was the aircraft carrier USS Princeton; 108 men aboard lost their lives, and the secondary explosions killed another 233 on the nearby Birmingham, which had been putting out the fires. Peggy Hull Deuell interviewed survivors and filed her story on the tragedy from an unidentified naval base. FROM A NAVAL BASE—They may be home now—the several hundred survivors of the light carrier Princeton sunk in the second battle of the Philippine Sea. . . . If you don't see the full selection below, click here (PDF) or click here (Google Docs) to read it—free! A college friend later told me of being a gunnery officer on a carrier, it may have been the Princeton, who had been observing a swarm of Japanese planes diving on embattled U.S. ships, and being shot down by anti-aircraft fire. In the end, he watched one kamikaze start its dive, and continue all the way down, through a hail of gunfire, to crash on his ship's wooden flight deck. After frantic efforts to keep her afloat, he and most of his shipmates wound up swimming in waters almost certainly over 10,000 feet deep, waiting for rescue. Meanwhile on the beaches of Leyte, U.S. Army soldiers were in a long battle to defeat, ultimately, 100,000 Japanese troops. Many have forgotten that crucial land battle that earned the U.S., and the returning General MacArthur, a foothold in the Philippines.